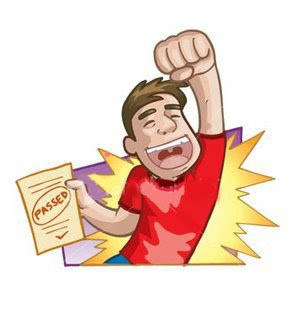 Angel in the Sickroom: I Passed My Exams! I'm quite happy that I got through my exams and passed both my nursing lecture and related learning experience final exams. I'm quite confident that I will also pass in the final grade (well I'm still hoping at least). My quizzes aren't that good but my term exams are quite ok.
On the other hand, my block mates and I were able to pass our grand case study/presentation of a 47 year old male with acute coronary syndrome and pulmonary embolism likely with hypercoagulable state secondary to polycythemia vera. Our grand case presentation may have a lot of corrections and errors but it was quite amazing that we even passed. In nursing research my group's thesis proposal of "Factors that Influence the Adherence of Delivery Room Nurses to Sterile Technique in Cagayan de Oro" has been accepted even if there were also errors and corrections starting from the cover page to the last page. But you know what's ironic? I may have passed my major nursing subjects but I have doubts if I passed English. Oh my gosh! Imagine what were discussing in English! Art and it's history! The exam is harder than our medical-surgical nursing exam, imagine that! Oh I just hate history. Like what use do we have for knowledge about art and sculptures in the medical field? Is it needed so that we could have something to talk about with our patients who are inclined to art? Anyhow I really thank God for aiding me in passing my exams! Like I didn't study for our exams and I still passed! I am really so happy! At last! No more Medical-Surgical Nursing! Yehey! Welcome Summer 2008!